Life's uncertain so eat your pudding first! Jess - Mrs Hathaways grandaughter, here for the summer with her younger sister Georgie. Mr Bates - Now running a kennels at the oformer ruined cottage on Menacoell. I was all set to not like this book a single bit, I hadn't thought much of it's predecessor Treasure on the Moor, thought even less of the following book Suspicion Stalks The Moor and knew this one would be lacking the main characters from the first 5 books. However I can honestly say I enjoyed it as much, if not more than any other book in the series...and considering the times I have been thoroughly disappointed by books I have wanted so desperately it was somewhat refreshing to say the least. The AsheyPales, as Sukey and Chris were known in Treasure, really come into their own in this book as they take over the main character slots previously filled by Louisa and Frances Burnett. They have turned from feeble city kids, struggling to adapt to their new surroundings into much stronger, dependable and infinitely more likeable characters. SuKey and Huw emerge as the new 'leaders' within the group, a void that is left by the absence of the Burnetts, older Hamilton's and the Jackson's. Danny is now fully integrated and accepted as part of the group and we see the return of the quite frankly 'horrendous' Angela. A pushy, in your face brat who more than meets her equal in the impertinent and downright obnoxious equally spoilt brat Jess. Unlike Jess, Angela has a few moments where she almost manages to redeem herself but Jess is selfish and out for herself through and through. She is also even more dislikable due to her natural ability on horseback...she immediately has the unschooled and difficult Russet going beautifully for her to further irritate the others.The Ashyplaes ponies are new reformed characters due to the help from the Burnetts and Snowman makes an interesting addition to their stable. He is a skinny mass of bones covered in warts who neither of them really want but as Sukey begins to ride him he proves himself to be a wise old hand and super all round performer...there is even a happy ending when his warts disappear! The only thing I didn't like was the absence of the previous main characters and poor explanations of this in the case of the Burnetts. The Mitchell's had been being fazed out slowly for a while and are no great loss, The Jackson's were busy running their trekking centre and again this had been building up for some time, the older Hamilton's were away with their TV star/producer (I forget which) father, which was plausible but the Burnetts absence was due to their mother being ill and needing to recover in a warmer climate. Hello this is the 1980's, this might have been common in the 40's and 50's but did this really still happen in the 80's? I for one am not so sure but stand to be corrected. I know Josephine didn't want to bring in new characters but was made to by the publishers...I fear it was almost deja vu of the Noel and Henry series as her publishers didn't like the hint of romance between Noel and Henry and you felt a relationship was blossoming here between Frances and Felix too in the same subtle way. Whatever the reasoning the old characters were well and truly dead and buried apart from odd fleeting mention early on in this one. The book is an enjoyable read with or without the characters of the first books and more than holds it own within the series. It showed her diversity as a writer as she shied away from her usual style of pony based story and embarked on a more adventure/mystery theme with ponies thrown in......maybe it was the what was popular and 'wanted' at the time as the Peter Grey Kit Hunter series and Linda Craig Mysteries by Ann Sheldon all got re-released in the early 1980's too but for me it will never be able to live up to and will always be a poor relative of her earlier classics such as Six Ponies and Pony Club Camp? It may be more sort after than these books but that is purely down to the rarity factor rather than content in my opinion. I would still give it a 4 horseshoes rating. Thanks for this excellent review. I really enjoyed reading it...makes a nice change from writing them! I couldn't remember anything about this book before reading the review, now there is a faint glint of remembrance in the darks space between my ears! ;D As soon as you mentioned the oil spill it came back to me. As I never read Treasure for some reason, I remember wondering why all the new characters. I suppose it would be easier following the series if I had read it first. I am not really a huge fan of this series. I am not as keen on the 'adventure' type pony novel. 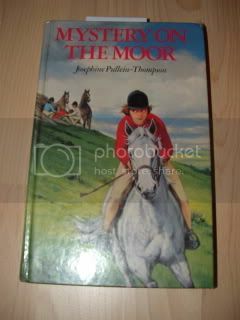 Both Christine and Josephine seemed to go through a phase in the late 70s/80s with adventure stories, not only the moors series but pony patrol, black pony inn, save the ponies, race horse holiday, etc and also the later phantom horse books were adventure types, probably as you say as this was what kids wanted at the time. However as I mentioned on my website, for some reason Diana never really went down this route. As i prefer the more classic pony stories such as the pony club series, prince among ponies, etc, the moor were not my favs - but I do agree that mystery was one of the better ones. Also agree that probably the only reason they are so sought after is that they are very rare - bit like Sheila Chapman I suppose. I would probably rate it as 3 horseshoes but this is from a reading a long time ago so I may have to revise my rating if I read it again! Please do not pm me as I am using the proboards app and the pm box doesn't load. I will not see it so it's a waste of time bothering. Thanks. I read this book from the libery, and real injoyed it. I loved Snowman.